Conventional farming techniques usually involve cultivating a large plot of land which is planted in rows. This method works fine if you have the land to do it. But many city or suburban dwellers simply lack the required space. Some may have the space, but they think of all that watering and weeding and rototilling... and well, their eyes just glaze over. That's why people have begun to look for new, fresh approaches. For example, you could easily double up your planting rows. I call these in-ground row beds. The walking space between each row bed can be slightly wider than conventional rows. This space can become a permanent walkway. You could mulch it or even use stones / bricks to keep out weeds. Your paths are never cultivated & never need plowed. Your beds are never walked on and don't get compacted. Soil tilling may or may not be needed. Watering can be done efficiently with drip irrigation. Soil amendments are not wasted on walking spaces. Your preferred technique will depend upon available resources, machinery & lot size. In-ground row beds cost little to set up versus conventionally spaced rows. The next step would be to consider raising those rows. You could try mounding up the dirt or building frames that are backfilled with soil / compost. Why bother with this? First: Soil Improvement. If your native soil is hard clay or is very infertile, you could add rich, amended soil right on top. Secondly: Drainage. If your plot is in a low lying or poorly drained area, raising your planting bed can help dramatically. See the benefits of switching from an in-ground plot to a raised bed. Another popular gardening method out there involves using raised beds, no wider than 4 feet. Commonly referred to as Square Foot Gardening, the idea is to reach from outside of the bed and NEVER actually step into it. This eliminates the need for rows, reduces weeding, watering and soil compaction. This technique commonly calls for a soil mix of: 1/3 Peat Moss, 1/3 Vermiculite & 1/3 Rich Compost. As a raised bed, the drainage is improved, but the soil additives also allow for good water retention. Soil composition, drainage & funding will influence how you set up your beds. 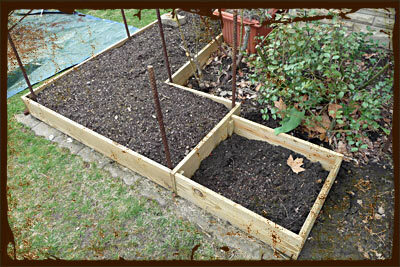 CONSTRUCTION: There are many options for constructing a nice raised bed garden. Retailers now offer a variety of kits to choose from. These may be wooden, plastic or composite based. You could also get yourself a few boards and design your own. A cheap solution would be to buy 1" x 6" boards, but you could go up to 2" x 12" for more depth and stability. Some sources will warn you against using pressure treated lumber. Alarmists throw out the word "chemicals" without producing any real facts. Here are the facts: As of 2004, residential lumber sold in the US is no longer treated with chromated copper arsenate (CCA). The "chemicals" people were afraid of (arsenic and chromium) have been replaced by alkaline copper quaternary (ACQ). I have seen no evidence that ACQ lumber poses any threats when used in garden beds. So buy new treated lumber and you'll be ok. And your bed will last longer than untreated wooden beds. Switching from conventional row farming can lead to great soil & water savings. Square Foot Gardening seems to yield good results. However, one thing about this method that I don't like is the spacing. This method divides your bed into a grid made up of 12" squares. Your largest plants are allotted 12" while smaller plants may get 6" or even 3" squares. But from what I've seen, some plants need more than 12" of space. Escarole, Kale, Peppers and Tomatoes may need 18" to 24" pretty easily. If your plants are crowded, some will be left starving for light. Air circulation is also reduced, which can lead to disease in extended periods of cool, damp weather. Pests, like stink bugs can be harder to identify & quickly eliminate. For reasons like this I believe in eliminating the whole square grid system. Use the raised bed, but allow your plants to dictate the layout of your bed. Use a grid, use rows, make groupings, whatever works! Meanwhile, there are other efficient methods out there. Let's look at them as well.